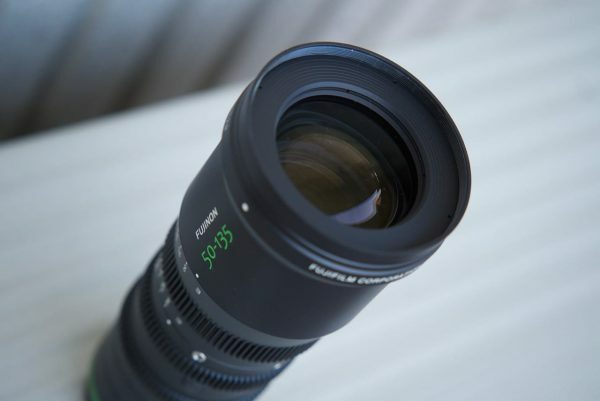 The Fujinon MK 50-135mm T2.9 is the sister lens to the MK 18-55mm, and together they look to make a nice two lens set for users of Sony E-mount cameras such as the FS7 and FS5. Up until a few days ago the only time I had touched or seen one of these lenses was at NAB. Fujinon Japan graciously loaned me the 18-55 and 50-135 for a few days so I could get some hands-on experience using the lenses. 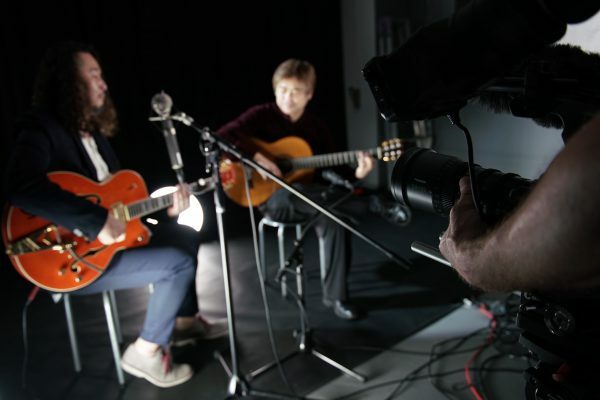 With limited time to test the lenses, I took them out to film a couple of flamenco guitar players at AGAI Trading in Tokyo, who were kind enough to let us use their studio and lend us some lights to use on the shoot. 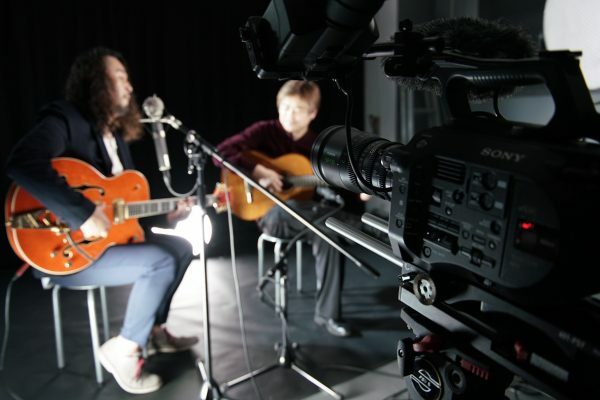 I don’t own any E-mount cameras apart from an a7S, but luckily one of the guitar players, Shinichiro Jojiki, is also a shooter who happens to own a Sony FS7. 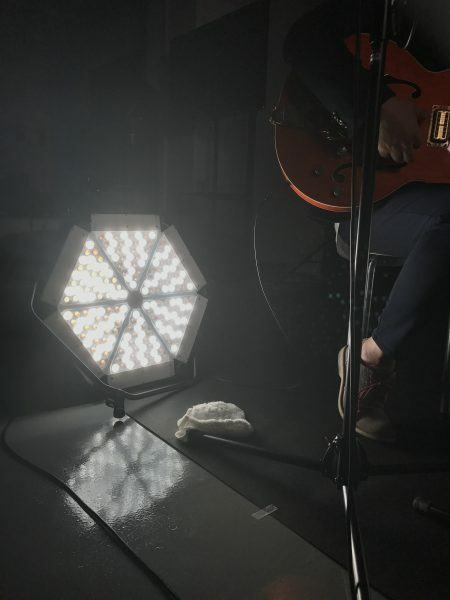 AGAI Trading provided us with a few new lights that I had never used before- the Dracast DRPL-FL-500B, SUMO SUMOSPACE and the Fotodiox VR-4500 and VR-1200. We set up the lights in 20 minutes and placed the guitar players in front of a black curtain. I purposely decided to shoot almost everything wide open at T2.9 for two reasons: firstly the space we were in was small and I didn’t want to see any of the background, and secondly, from tests I had done the day before I found the lenses to be very sharp even wide open at T2.9. Most lenses perform well when stopped down (even a lot of the cheap ones), so for me the true test of a lens is how well it works wide open. This was also a good test to see how well the MK zooms worked from the perspective of a solo operator. Going into an environment I hadn’t seen before with no set plan, and using a camera and lights I wasn’t familiar with, is a real world scenario a lot of us encounter. For me there is no better way to test a product. 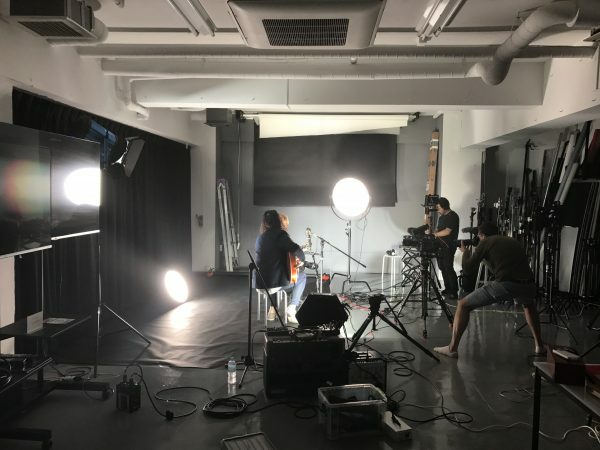 Special thanks to the musicians Shinichiro Jojiki and Norihide Yamamoto for giving up their valuable time, to Taro Irei for doing the sound, and Jeff Cooke for the BTS photos. The first thing that definitely impressed me was the weight, or lack of it to be more precise. 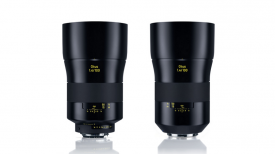 At just 0.98 kg (2.16lb) these lenses are really light and actually weigh less than some of Sony’s E-mount zooms such as the FE 70-200mm f/4 G OSS. 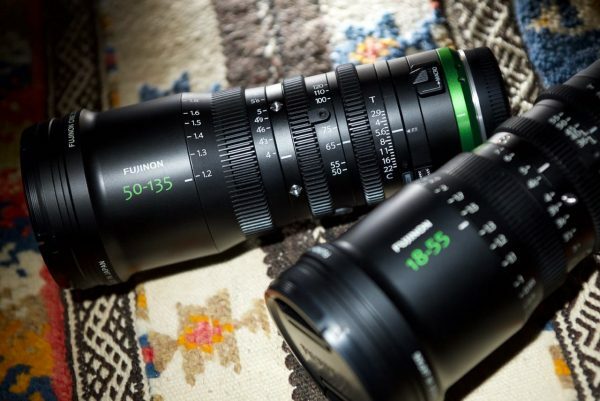 The MK Fujinon zooms are also only marginally heavier than the Sony FE 24-70mm f/2.8 GM and Sony FE 85mm f/1.4 GM. To have a proper cinema-style zoom lens with no focus breathing and a constant aperture of T2.9 across the zoom range, all in a package that weighs under 1kg, is truly an engineering marvel. For me, this low weight is probably the biggest strength of the MK zooms. 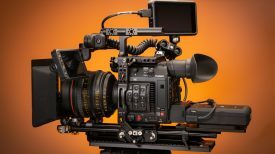 On small cameras, or even cameras the size of an FS5 or FS7 you don’t want to use a large, heavy cinema lens because it makes the camera very hard to balance and you start needing to carry around larger tripods and use rods with a lens support. It’s for this exact reason that a large proportion of shooters with E-mount cameras are using stills glass. With such a low weight, you would assume that the build quality of the MK zooms would be average at best. I was pleasantly surprised by just how well made the lenses are. Yes Fujinon have had to make the housings out of a more lightweight material, but the lens still feels solid in the hand. The focus, iris and zoom rings are all really nicely weighted and have just the right amount of resistance. The only thing I found on the lenses that felt a little plasticky and not smooth was the macro adjustment switch. The front filter diameter is 82mm. The front filter diameter of the lenses is 82mm which is very handy if you want to use screw on filters, or a variable ND if you are using the zooms on say a Sony a7S. The barrel on both the 18-55 and the 50-135 doesn’t extend when zooming which makes them suitable to use with a matte box. How are they to use? In my opinion, proper cinema lenses offer a much more organic feel when shooting video than stills glass. Cinema lenses allow you to make subtle adjustments to your shot without it being obvious to the audience. Focus breathing, image shift and electronic aperture control can all be major distractions for viewers. The MK zooms give you all the benefits of a larger cinema zoom lens in a much more compact and easy to use package. 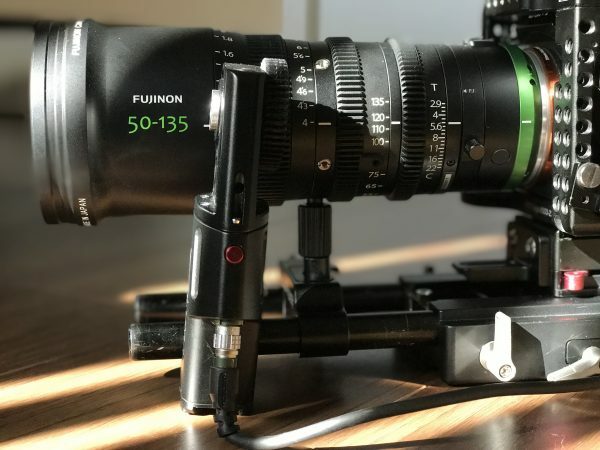 The benefit of keeping the Fujinon zooms so small is that despite the focus rotation being 200°, the physical size of the lens barrel is still small, so you can very easily pull focus without the need of a remote or rail mounted follow focus. 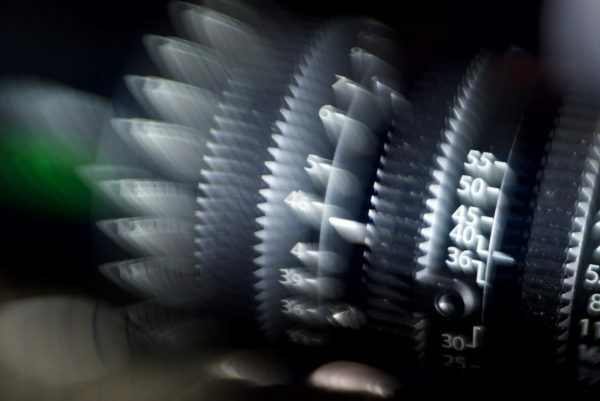 With most cinema lenses the focus rotation along with the physical size of the barrel makes this very hard to do if you are pulling focus by hand. Speaking of focus, the lack of any noticeable focus breathing on these lenses is extremely impressive. Above you can see a couple of shots that illustrate just how well controlled the focus breathing is. I personally hate seeing an image shift when someone is pulling focus, not only is it distracting but in a lot of cases it also looks horrible. 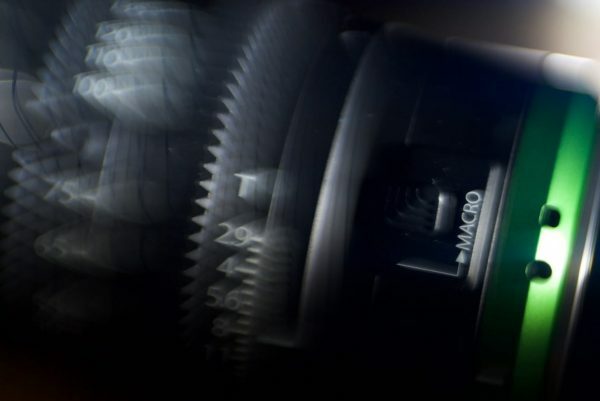 The MK zooms allow you to do super smooth focus pulls which are as good as any high end cinema lens costing tens of thousands of dollars more. 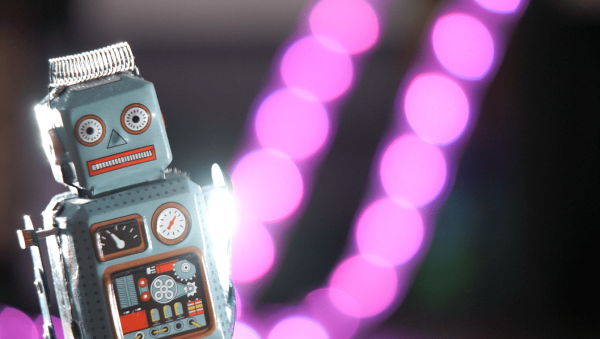 The iris and zoom are just as nice to use as the zoom. Again, because the physical size of the lens is so small the focus, iris and zoom gears are all close enough together that you can use 3 fingers on one hand to control everything at the same time. Neither the 18-55 nor the 50-135mm have good close focus ability. To overcome this both MK zooms feature a macro switch which works in a very similar way to those found on ENG broadcast lenses. The macro allows you to achieve closer focus than you would otherwise be able to achieve, but I found the switch to be quite clunky and not particularly smooth. Nonetheless, it is a nice feature to have and it’s not something you usually find on lenses. For me, I did find it be very useful for creating certain shots, given the close focus ability of both the 18-55 and 50-135 is limited to 85cm and 95cm respectively. If you are not used to using a lens with a macro switch you may well find yourself forgetting to disengage it though, and wondering why you can’t focus to infinity. One thing to be aware of if you plan on using the MK lenses with a remote follow focus you have to use a lens support otherwise the torque from the motors will physically move the lens around on the mount. This is one of the big limitations of Sony’s E mount unless you are lucky enough to be using the FS7 Mk II that has a locking version of the mount. 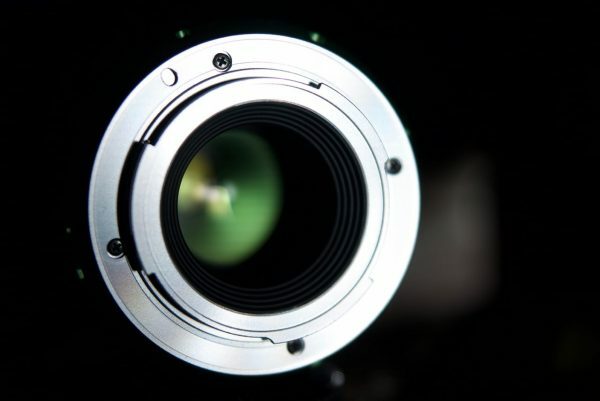 The MK zooms cover a 28.5mm diameter image circle for cameras with a Super 35 format 16:9 aspect ratio. They don’t cover full frame sensors so If you want to use them on a camera like a the a7S/a7r you will need to do so in the APS-C mode. 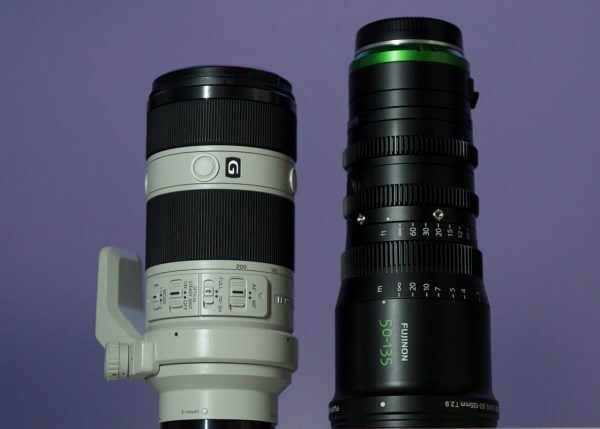 The MK 50-135mm T2.9 and MK 18-55mm are both optically very impressive. They have a ‘look’, which is a little clinical and on the magenta side. Both lenses are very sharp, even out to the corners, exhibit almost no signs of chromatic aberration, and produce nice neutral looking images. 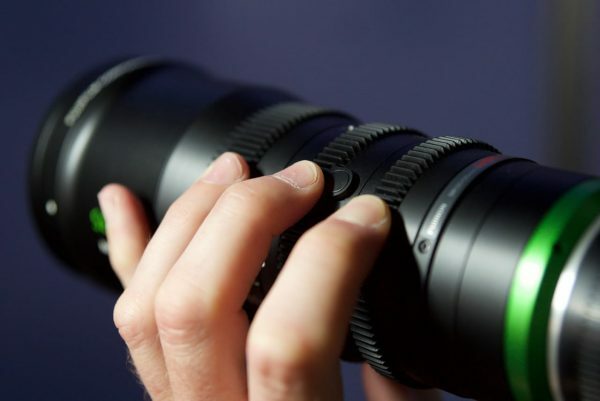 The lenses have a good amount of contrast which is good news for shooters who need to turn material around quickly without having to do any colour grading. The lenses are incredibly sharp, and even wide open at T2.9 they perform very well. Once you start stopping down to T4 they improve even more, and by T5.6 (particularly when it comes to the 50-135mm) they are absolutely tack sharp. The sharpness of the 50-135 wide open at 135mm is really impressive. The image looked so sharp I had to keep checking that I actually was at T2.9 and not stopped down to T4 or T5.6. The MK series are fairly flare resistant, but you can still get some nice results with the lenses depending on how you use them. I personally thought the 50-135mm at 50mm produced the nicest flare out of the two lenses. Both lenses produce pleasing bokeh and when you use the 55-135mm at the end of its focal range you can get some really lovely results. Even wide open at T2.9 the lenses exhibit no signs of chromatic aberration. Both lenses exhibit almost no signs of chromatic aberration, even when wide open at T2.9. When I purposely heavily over lit a flat, shiny surface I still couldn’t see any CA. The 18-55 does exhibit signs of lens distortion, particularly at 18mm. This is not that uncommon on zoom lenses at this focal length, but more expensive cinema zooms tend to have less distortion of straight lines than the Fujinon. Both lenses for all intensive purposes should be considered parfocal, and to the naked eye there is no real evidence to the contrary when you use the MK zooms. While there is nothing optically wrong with the lenses at all I personally found that they lacked any sort of character. 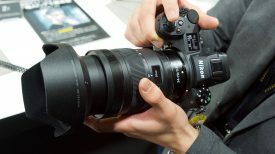 This is not a slant against the Fujinons, as there are plenty of other lenses on the market these days that have a very similar look to the MK zooms. 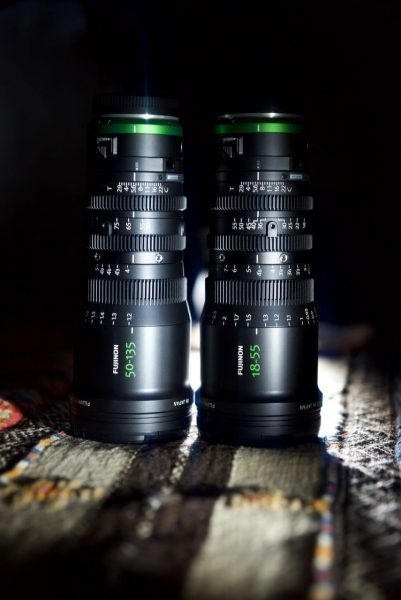 The zooms do seem to pretty closely match a lot more expense Fujinon offerings such as the Cabrio and XK series. This makes the MK zooms a good choice to use on smaller B-cameras that you may want to match with a larger cinema camera running a Cabrio or XK series zoom. In my opinion the MK zooms certainly punch well above their weight given their relatively low cost. They offer image quality that is right up there with cinema lenses that cost substantially more money. The limitation is that they are only available in Sony E- and Fujinon X-mounts, which means they can only be used on a select number of cameras. They also only cover Super 35, but I really don’t think that is a deal breaker for most shooters. 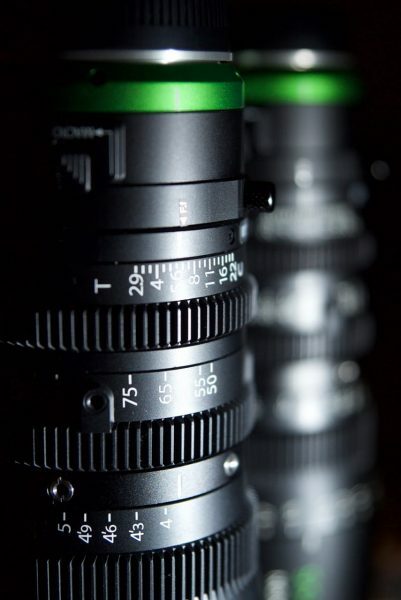 If you own a Sony FS7 or FS5 and don’t want to use stills glass, the Fujinon MK zooms make a lot of sense. For the FS7 or FS5 there is nothing out there on the market that comes even close to offering the form factor and features that the MK zooms can at this price. 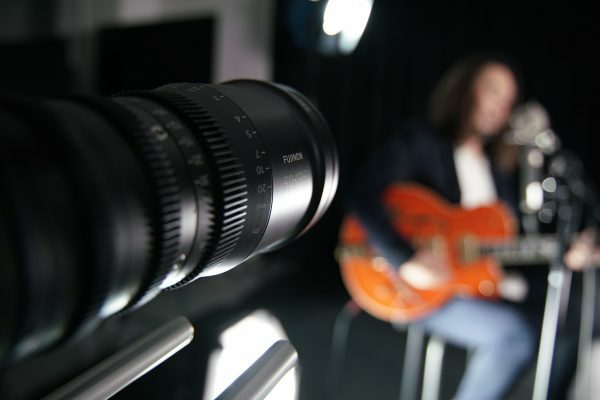 The lenses let you get on with the job without having to worry about the equipment you are using, and this is perhaps the biggest compliment you can give a professional product. 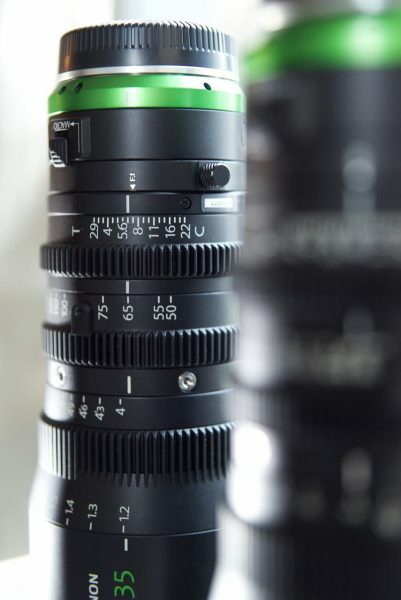 Fujinon have done a fantastic job with the MK series and have produced a couple of lenses that offer cinema zoom performance in a compact form factor that suits the cameras they have been designed to work on.